Cosmetics, Medicine, Food, Paiting, Etc. Our Aluminum tube is made of good quality aluminum material with advanced printing machine in a GMP workshop. These tubes are widely used for pharmaceutical ointment/cream packing, and also cosmetic packing, such as hair dying cream, hair bleaching cream, etc. All materials are new and professional for pharmaceutical package use. We never use re-used materials. Inside the tube, it is coated with a layer of Epoxy phenol-formaldehyde resin. This resin is a stable layer to separate cream/ointment contacting aluminum directly. 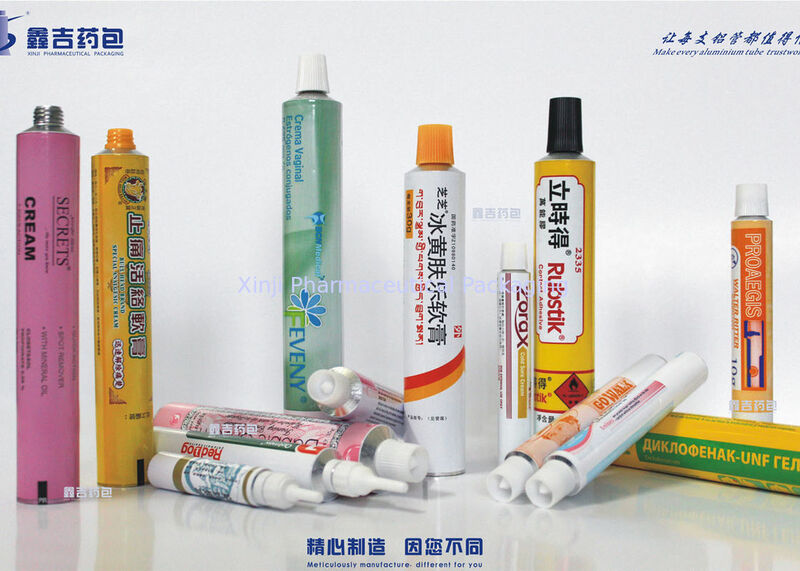 Useage Pharmaceutical, cosmetic, food, adhesive packaging, etc. CAP Colour-white/red/blue; Type-Conual Piercer; material-HPPE. The standard of Inspection BS2006-86 Aluminum tube for medicine ointment. 1. Scale. Top 3 manfuacturer of collapsible aluminum tubes in whole China, with annual capacity of 300 million pcs. 2. Experience. Nearly 40 years' accumulated specialized producing experience in this field. 3. Production Lines. Full automatic production lines from Germany and Italy. 4. Quality. All select superior raw material, with mature producing technology and high standard quality control and inspection system, we can greatly guarantee the quality. 5. Price. Factory direct sells, offering you the most competitive price! 6. Service. Quick response on quotation, sample and after-service. Adhere to the business philosophy “Meticulously manufacture, different for you”, we clearly understand the needs of customers, establish supply chain system and appropriate procedures based on customer needs to maximize customer satisfaction . For any quality problems, analysis the cause with high standards in order to establish a long-term mechanism; Each employee should understand how their daily work affects the quality level and customer satisfaction, continue to improve their own work for better service to our customers.